I have been busy recently in my studio and am happy to report that I have submitted work to two shows so far for the month of June. The first venue is a familiar one – The Carrack celebrated its third anniversary and hosted another community show. Over 60 local artists participated. Me and my ladies (wife + daughter) stopped by the reception on Saturday and had a cold one while we listened to DJ Mike B and took in the local fare. I submitted Smells of Nature to the show. The second venue is new to me. Over the winter I joined the Durham Art Guild, a collective of artists in my area. Beginning this week they are hosting a member showcase. I created a new piece specifically for this show that I feel represents the direction my work has taken recently. 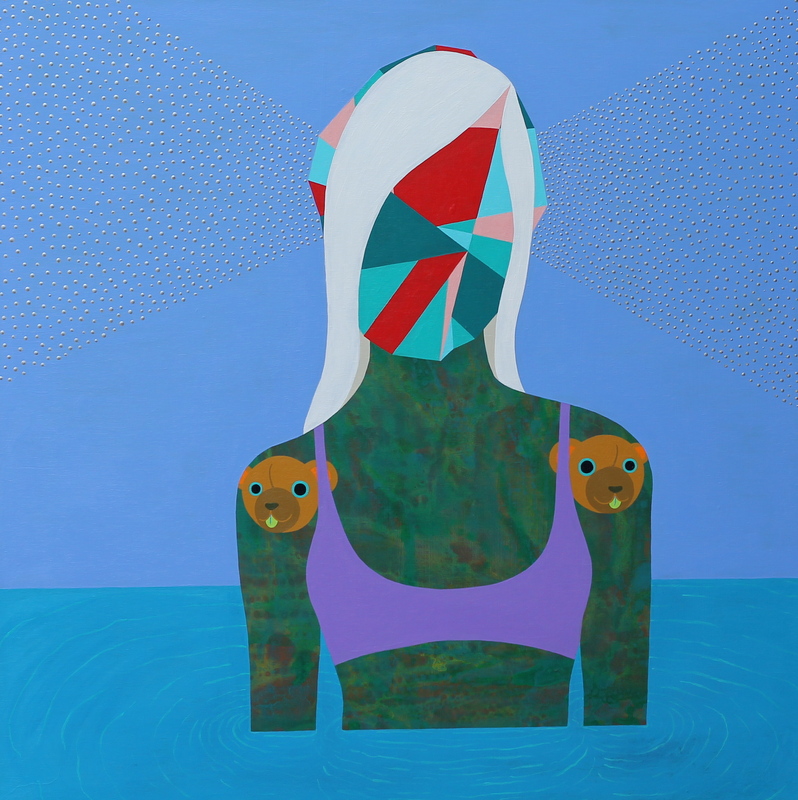 The painting is acrylic on wood, measures 24″x24″ and is titled Betsy. This painting is of a female figure in water. Her facial features are absent and instead they are replaced by a geometric pattern. Her body is a green, blue, orange and yellow wash. My favorite aspect of the painting is the figure’s posture and downward gaze. I was worried that a gaze would be difficult to convey without actual eyes, but the geometric lines function in a similar manner and give the effect I was going for. If you are around, the public reception for the show is during Durham’s Third Fridays, June 20 from 5-7pm. Also this week my work is coming down from Respite. I feel very fortunate to have had this opportunity and have had a great response from the local community, including selling three pieces and doing two commissions. I wish the next artist the same luck. And finally, looking ahead, I was accepted back to the Virginia Fall Foliage Festival this year. That show is such a big deal to me because it is in my hometown. Looks like the next few months will be busy in the studio as well. Cheers to that!